November 07, 2018 at 9:43 am. Michigan State doesn’t have a quarterback controversy entering its Big Ten East Division showdown with Ohio State on Saturday. Coach Mark Dantonio squashed all that talk during his weekly press conference, declaring Brian Lewerke his No. 1 guy. 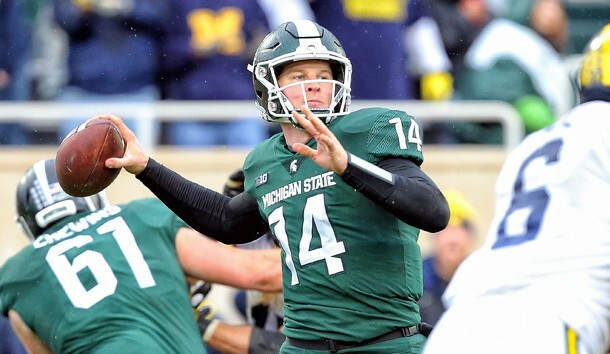 Backup Rocky Lombardi led the team to victory over Purdue two weeks ago when Lewerke sat out with a shoulder injury, but Lewerke was back behind center in the team’s 24-3 win at Maryland. No. 18 Michigan State (6-3, 4-2 Big Ten) is two games behind Michigan in the division standings but could still wind up in the Rose Bowl if it wins out. First, it would have to knock off No. 10 Ohio State (8-1, 5-1), which hasn’t lost at Spartan Stadium since 1999. The Buckeyes need to win out to remain in contention for a College Football Playoff berth. They won’t have a chance if they continue to play like they have the past two weeks.